I have gone 6 W 2 L against “meta” decks, although it is a little unclear as to what the meta exactly is right now. I’m 5 W 1 L against Buzzwole and 1 W 1 L against Espeon GX / Garbodor / Drampa GX. I have lost all three games I’ve played against Dusk Mane Necrozma GX and also the game I played against Solgaleo GX / Registeel. Yes, that’s four of my six losses came to Metal decks. Maybe I should tech in Weakness Policy? So there’s a definite rhythm to this deck: you always want to have a Fairy Energy, a Max Potion, and a energy removal card of some type. Energy removal is a key area of judgment: it’s hard to decide whether you want a Flare Grunt, Plumeria, or E Hammer. And if you’re grabbing a Fairy Energy and Max Potion, you only get one other choice. But make no mistake about it: you want to knock energy off every turn. Plumeria is good for this too. If you’ve pooh-poohed Plumeria in the past, she is perfect for this deck. A lot of times your opponent will try to load up energy on the bench, but you can still reach all the way over and take that energy off with Plumeria. And the extra Talonflame are GREAT Plumeria fodder. 56% of the decks I’m facing this month are running SPE – even if only Beast Energy, so your E Hammers will come in handy too… and if your opponent doesn’t play SPE, the E Hammers can be used for Plumeria as well. Early on, you want to be knocking off energy as much as possible. Don’t worry about your deck count too much – if you are a few cards lower than your opponent, that’s ok – you’ll make it up at the end with Team Rocket’s Handiwork. Handiwork is great at the end because it gets your opponent closer to decking out, but it also deprives them of absolutely vital resources they desperately need. If you dump their last Float Stone into the discard pile and you’ve stranded a high retreat cost Pokemon in the active, it’s an easy win. If you want to climb the ladder, this deck will win you a lot of matches. It’s not very good in events (tournaments) on PTCGO, however, because twelve and a half minutes is NOT enough to win prolonged games. 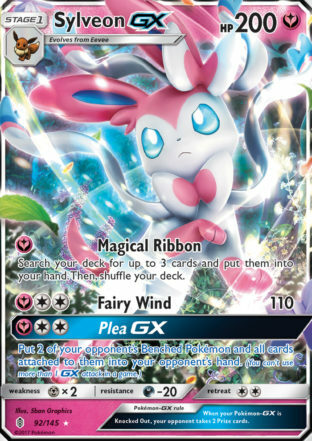 Also, I don’t think Sylveon is as good IRL because there are a number of decks that LOVE to have energy in the discard. I didn’t actually go up against Ultra Necrozma GX Malamar or Necrozma GX Malamar. I don’t think it will do well against Necrozma GX Malamar, but I actually think it will do alright against Ultra Necrozma, not just because of the weakness, but because if you can knock off all the Metal energy, you’ve effectively neutralized it. But like I said I didn’t actually face them, so that’s my theorymon. Hopefully this deck will help you win quite a few games, and I hope you have as much success with it as I’ve had. Previous Post:Discount Deck: Barbacle Stall/Mill Deck!